I shall begin this week by giving a huge shout-out to Iñigo to jump in for me last week! I apologize to everyone, as I was attending NYCC! To say the very least, I was knee-deep in comics for a couple of days! Quick question for everyone here. Who loves Tony Daniel’s Batman art? I am a big fan. And I know I am not alone. 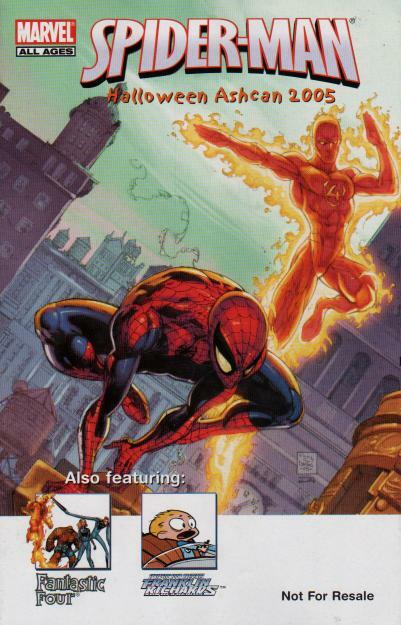 But did you know he also did some Spider-Man covers for the Spider-Man Unlimited run from 1996? True story! I was going to give you one of those this week, but I decided, since it is almost Halloween to give you “Spider-Man Halloween Ashcan 2005”. This was given to Comic Book stores, and some bookstores back in 2005, as promo advertising material. Some stores handed them out at Halloween, some did not. Love the cover. As for a story, unfortunately there is just a Spiderman and Fantastic Four reprint inside. You can find these on the bay, and a couple of online comic shops, and in no way are they expensive. They run from $1 to $10. These will never be found on a Top 10 list anywhere, but if you like Spidey and Tony Daniel, then go grab yourself one of these. Good luck! December 17, 2016 Hooked on Connecting Covers! I have some ashcans – this looks interesting. Thanks Jason.